Cori of Well Beauty Blog put Schmidt’s to the test and was NOT disappointed! “This is also really gentle on my skin. I have experienced zero irritation from this. Newly shaved skin even handles this with ease. My boyfriend had tried Soapwalla way back when and got a rash from it, so I had him try the Cedarwood+Juniper one and he had no irritation and said it also kept him stink-free! 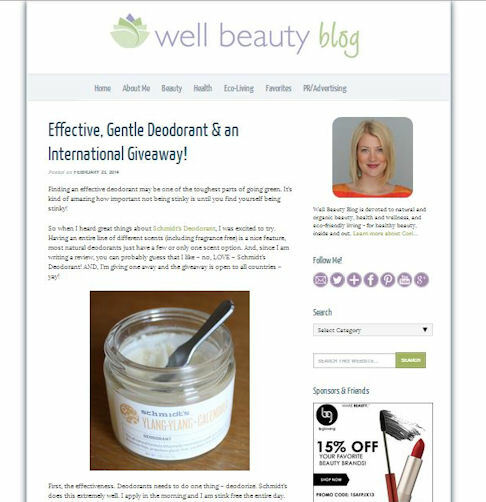 “ Click here to read the full article and get details on how you can enter for a chance to WIN a Schmidt’s Deodorant in your scent of choice.